I just got back from a rather quick and intensive trip to California and figured it would be fun to write up some of the things that happened in this journal post. 6 Mar: To start the day, my parents and I drove from the eastern edge of AZ (TX Canyon rest stop) to CA. I had contacted Dr. Victor Steinmann a few days prior and I was going to meet him today. Dr. Steinmann had offered to take me to a population of Euphorbia jaegeri (a really rare California endemic) off of I-10 out near Joshua Tree National Park. On the way there, we stopped near Phoenix, AZ and I saw what may be the narrowest leaf forms of E. maculata I've ever seen. Not a major find, but a fun find nonetheless. A few hours later, we met with Dr. Steinmann. He and I carpooled to the base of a canyon where E. jaegeri was located. Nearly immediately after getting out of the car, I managed to impale myself on Cylindropuntia ramosissima (serves me right for not paying attention in the desert). The wildflowers were wonderful. I recognized few of the genera and even fewer species. A full list can be found here. After climbing and talking extensively about Euphorbia, we found what we were looking for. A couple of the E. jaegeri plants were a foot across or more! It took more searching and climbing, but we eventually found a single immature fruit. Most of the plants had no cyathia. When we got back, we took a quick trip to Joshua Tree NP and saw all the wildflowers in bloom. Perhaps the highlight was seeing Tetracoccus hallii which used to be in Euphorbiaceae but is now a member of Picrodendraceae. A full list can be found here. At some point in the field, Dr. Jon Rebman replied to my email asking if I could come by the herbarium at the San Diego Natural History Museum. 7 Mar: In the morning, my parents and I drove to San Diego and went to the herbarium at the San Diego Natural History Museum. I got a ton of work done on one of the more complicated Euphorbia problems in Baja California. I nearly got as much done as I was expecting to but didn't get anywhere near as much as I wanted to. There are just too many species complexes that need studying. Perhaps the most interesting realization is just how bad of a catch-all group E. serpillifolia really is. There always seems to be more work to do in Euphorbia! 8 Mar: Not much to report here. I got a little time to explore a nearby park and a full list of things I found can be seen here. From this point on, I was preoccupied essentially the entire time with non-botany stuff. I managed to find a lifer and a few other little interesting things, but nothing like what I found those three days. In particular, Euphorbia peplus is a common weed throughout much of CA, but I have only gotten to see it once (in El Paso). It was nice to get to see the many plants of it growing in person. So naturally, I ended up adding photos of the two most commonly observed species on iNaturalist and they will get lost in the mess. :-) Also, to those who may have wanted to see me when I was in the area, I apologize for not reaching out. I would have loved to make more of the trip, but I just didn't have the time. Most of my observations other than those mentioned above were taken quickly between locations and even the stops above were much quicker than I would have preferred. Plants in the subfamily Asclepiadoideae all have a very interesting morphology. One particularly interesting modification is that the staminate and pistillate parts are fused together into a structure called a gynostegium. The stamens have been modified so that the pollen sticks together to form pollinia. Members of the Genus Asclepias (and some other genera) have a very specialized corona that forms structures called hoods and horns. This morphology is explained in the below longitudinal section. 10,000 Chamaesyces. iNaturalist sure has grown! iNaturalist has now reached over 10,000 Chamaesyce-type (Euphorbia sect. Anisophyllum) Euphorbia observations! iNaturalist has exploded with in terms of Euphorbia observations. But just how much has iNaturalist grown? I added my first observation in December of 2014. There were 279 Chamaesyce observations at that time. I didn't really get into iNaturalist until probably May of the following year. By the end of that month, there were 404 Chamaesyce observations. By the end of 2015, there were 939. End of 2016, 2,222; an increase of 1,283. End of 2017, 5,423; an increase of 4,140. And today, 10,363. We are 60 observations away from 5,000 observations for the year of 2018 [UPDATE: as of 25 Nov 2018, we are at 13,107; this totals 7,684 for the year]. By the way, for the genus Euphorbia, the number was 2,351 at the end of May 2015. Now, it is 27,029. 15,873 of those are from the United States. This growth has led to so many interesting discoveries and there is now at least one verified observation for every Euphorbia species in the continental US except 22 (information here). It has directly led to the discovery of at least 4 state records and so much understanding about the variability exhibited in these species. There are 125 Chamaesyce species that have been observed (a few not yet verified) and 556 species of Euphorbia in general. This is a huge accomplishment and I am grateful to everyone who has contributed thus far. There is a downside to so much growth. At some times, I have been overwhelmed by the flood of observations coming in and had to focus on only the most interesting observations. This has gotten me thinking about the future. If the rate of observations increases, there will come a time when I will be unable to manage it. When also taking into account factors in my own life that will inevitably limit my ability to contribute IDs, I think it is time to refocus my efforts. Soon, I will start focusing heavily on writing up papers, guides, journal posts, etc. that focus on helping others learn what I know to help with higher quality identifications. As such, I may start ignoring bad identifications of very common species in the interest of devoting more time to the above goals. I have already started to not explain my identifications unless the explanations are asked for. If I gave an ID without an explanation, please don't take it personally or be disappointed that you got the wrong ID. Chances are, I've seen a lot worse identifications and I've got of observations to get through. For now, I still want to look through all the Euphorbia observations, but I will start refocusing. For those who observe or identify Euphorbias, it would help a lot if you could learn the various groups of Euphorbia. That way, if I have to prioritize, I can look at sect. Anisophyllum without having to wade through the rest of Euphorbia so much. If you really want to help, the best thing you can do is learn your local species by looking through the species that have been observed in your area and ask for help with difficult ones. After that, share your knowledge by looking through the Euphorbias that are observed in your area and add your ID. Even if its wrong or already research grade, this will improve your search image. Many of you are already doing this and to those, I am most grateful. For others, I don't mind trying to coach along anyone who really wants to try to learn their local species. Lastly, please please please let me know if there is anything confusing about what I write or have written. Also, if there is anything that I have written on one of your observations that you think I should include in what I write, let me know. The goal is to make user-friendly documents that help anyone learn the different Chamaesyces around them. Thanks again everyone. iNaturalist and the community that makes it up is awesome. P.S., I have a resources list for two of my three projects, Euphorbia species of the United States, Euphorbia of Mexico, and Sandmats of the World. Sandmats of the World is a relatively new one and I have done very little with it so far. The best resources list at the moment is here. I recently got an infestation of Tomato Hornworms (Manduca sexta) on my tomato plant and turned it into an excuse to do a casual experiment. I decided to raise them on several different hosts to see if there was any color variation as I remembered seeing a silvery Manduca quinquemaculata on Silverleaf Nightshade. Anyway, the associated observations tell the story. Raised on Proboscidea louisianica (Devil's Claw). Initially collected as pests on my tomato plant. Initial observation here. When they started out, they looked like this: https://www.inaturalist.org/observations/13592914. Some were so young that they were yellow instead of green. I decided to let them go today as the tomato creates a lot of humidity in a little vial which caused problems. Also, my potato plants can't keep up with the caterpillar's needs. Despite this, I still might be able to check on the caterpillars started on native plants as I released them on the same plants they were raised on. 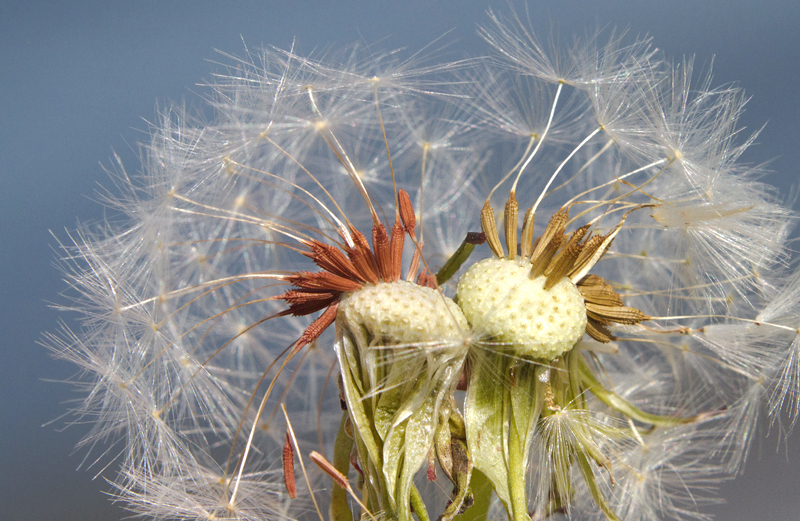 According to Flora of North America, there are two species of Dandelion (Taraxacum) in Texas: T. officinale and T. erythrospermum. Apparently, the only way to tell the two apart is by the color of the achenes. Taraxacum officinale has fruits that are "straw-colored to olive, brown, or red to pale or dark gray" while T. erythrospermum has fruits that are "brick red to reddish brown or reddish purple". What follows are some photos of what I believe are representative of both species. Taraxacum officinale at left, Taraxacum erythrospermum at right. I have always been dubious of colors as key characteristics and learned early on not to trust them. I have since learned there are some circumstances, but I remain dubious here. At the very least, it seems like there might be some structural characteristics here that would be much more stable that could be relied upon. In the previous photos, T. erythrospermum seems to be smaller on average (this was the largest achene I could find from the specimens I took), be less hairy, and be muricate throughout (the rough horn-like projections). Taraxacum officinale, on the other hand, seems to have minute hairs (contrary to the description) and be muricate only towards the apical end. There is also, of course, a color difference. In the plants themselves, T. officinale has a tendency to have harier peduncles in the environment these were encountered in. This is admittedly a very small sample size and I will try to follow-up with more info. Ideally, I would grow the two species and see how well they retain their parents' tendencies. Color is usually such an unstable characteristic that I'm still not convinced (as is leaf shape, the other characteristics used). Not only that but there is overlap in the description itself. I tend to think this comparison represents the extreme end of the variability of the two species and identification of other individuals is not usually this easy. So, I just found out that the tribe Coreopsideae has as it's common name "coreopsis and friends". Recently, it seems there has been confusion on iNaturalist between Malvella lepidota and M. leprosa. The differences between these two are not all that straightforward as can be read in the comments below. Most treatments include a combination of leaf-shape and hair characteristics. The characteristics, however, have many seemingly intermediate forms. This is especially problematic in the Lubbock area where many different forms can be found, though few truly reach M. lepidota. Before I go further, there are two main hair types that need defining. One is a silvery, scaly, bead-like (lepidote) hair and the other is a shaggy hair with many branches from a central point (stellate). In addition to these, there are various intermediate hairs called sub-lepidote hairs. The type specimen of M. lepidota has lepidote and sub-lepidote hairs and leaves defined by a broad base that abruptly tapers to a long (almost as long as broad) lanceolate and acute apex. The type specimen of M. leprosa has lepidote to sub-lepidote hairs and a leaf shape that is broad and rounded with no apical process. The shallow lobes are rounded unlike many of the Texas plants. Perhaps the only difference in hairs between the two types is that the hairs are often sparse along the veins of M. lepidota and uniform in M. leprosa, but even this is inconsistent. Also, M. lepidota includes a slightly wider diversity of hairs with the sub-lepidote hairs becoming close to stellate while those of M. leprosa are more uniformly between lepidote and short sub-lepidote. The sepals of the two are slightly different. In the type of M. lepidota, they are lanceolate. In the type of M. leprosa, they are closer to ovate. This could be helpful, but it seems that most of the observations have sepals that are closer to lanceolate. The type of M. leprosa is from Cuba, so it is expected that there might be some geographic differences. However, this means that sepals aren't as taxonomically stable. The Flora of North America treatment also includes the folding of the sepals where they meet each other, but I haven't really been able to tease much out that is consistent. In the type specimens, this information is not preserved. I may try to look into it again but will focus on other characteristics for now. All of what I discussed above makes things very difficult when trying to identify. Unless the sepal characteristic is viable, the main characteristic we must use is leaf shape. This is somewhat unpredictable as can be seen below. Gradation is not entirely complete, but close to it. Perhaps the closest distinction one can make in leaf shape is in the appearance of the leaf apex appearing as a separate lobe (i.e., added on to the base of the leaf similar to the first photo of M. lepidota or the apical leaves of the second photo of M. lepidota). This is not fully satisfactory as the young leaves in the second photo labeled as M. lepidota has broad leaves without this appearance. Going back to hair-type, there are four main plant forms. 1. stellate throughout. This was known as M. herbacea or M. leprosa var. herbacea. 2. stellate on undersides of leaves, stems, and sepals; sub-lepidote or lepidote otherwise. This is M. leprosa, but differs from the type. Perhaps some odd morphs of M. lepidota (according to FNA)? 3. lepidote and sub-lepidote hairs only. Includes M. leprosa (the type) and M. lepidota (the type). Malvella leprosa hairs from Lubbock. Malvella sagittifolia hairs from Alpine. This summary only reflects the types and the US observations on iNaturalist and may need other locations to fully understand the diversity, but this is a good starting point. Now, for the examples. The shaggy, stellate hair form. This is what was refered to as M. hederacea or M. leprosa var. hederacea. A texas observation can be found here and here. Lepidote hairs. On the leaves, lobes on the triangular appendage coming out from the base. Lepidote hairs. On the leaves, no lobing on the triangular appendage coming out from the base. Another thing that complicates identification is that the leaves of Malvella are oblique (asymmetric). If we are supposed to know if a leaf is wider than long, it should be important to know where to measure from. However, knowing exactly where the width is supposed to be measured from (perpendicular to the petiole or at an angle to the petiole) is not clear.